Almost supernatural power to increase boutique sales. Magic Mirror blends our innovative motion sensing technology with the concept of augmented reality to make real sales. 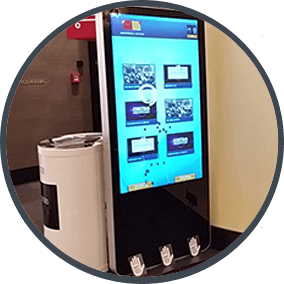 It enables your customers to try on your products in an entirely new, touchless way. By using natural, intuitive gestures, customers are able to see how they look like in your clothing and accessories, without actually putting them on or touching anything at all for that matter. They are also able to find out the pricing of each item, and make orders right away. The software informs you of new orders, and provides valuable insights into the behavior of your customers, their wishes and preferences. By using this original sales multiplier — inside your boutique, outside of it, or even on the street, you’ll attract more customers and add a new stream of revenue. If you have any questions or need more information, send us a message. 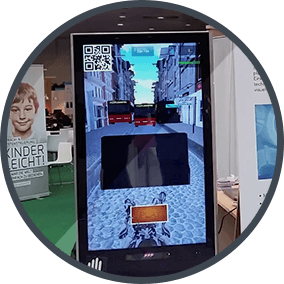 At Magic Schaufenster, we develop gesture-powered marketing campaigns and sales tools using augmented reality marketing technology.